As noted by researchers with The American Journal of Occupational Therapy, the emergence of occupational therapy in the early 20th century coincided with the rise of the Little Theater Movement, in which semi-professional actors would use puppets to explore various social issues confronting workers and immigrants in an increasingly industrialized world. It was mostly a purely creative outlet for the working class, but occupational therapists seized on the functional elements of drama to help teach patients everyday life functions and socialization. Marionette shows and comedic plays were especially popular. Occupational therapists found that patients could be compelled to identify more complicated emotions and behaviors with puppet play, ultimately successfully exploring numerous conflict resolution strategies in a way “just talking about it” face-to-face with a therapist didn’t make so easy. At the time, most occupational therapy patients were adults. But our occupational therapists know now puppet play translates well for uses in numerous modern-day child therapies too. Although some might view puppets as a bit antiquated in an increasingly advancing technological world, we have found many kids find them highly entertaining (especially if they have some control over the puppet) – which means they are more motivated to engage and learn! One of the greatest things about working with puppets in occupational therapy and speech therapy is that while these cloth pieces are caricatures that represent people, they get away with many things real people usually can’t. That allows children to engage in play that is imaginative and enjoyable, while still exploring tasks or concepts that are difficult or complicated. Role-playing can help children improve not just understanding of their own role, but also empathy for what others are thinking or feeling. 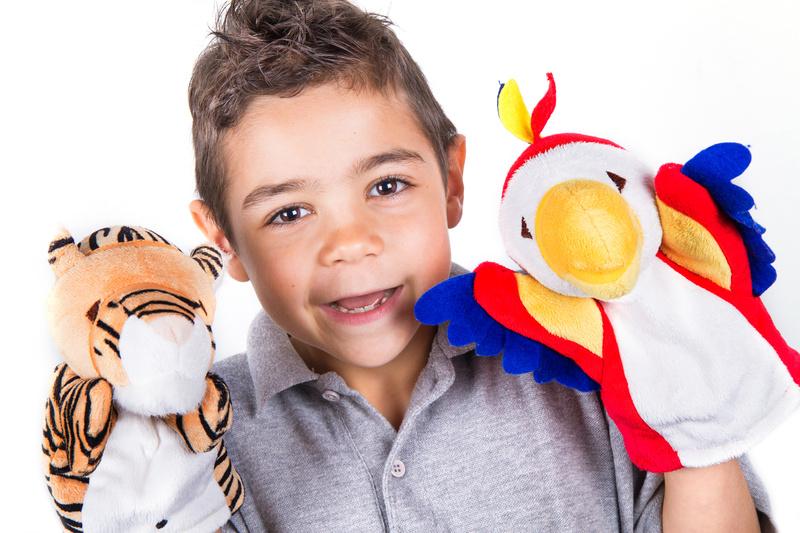 The Autism Resource Foundation has concluded children with autism especially may benefit from the use of puppets in therapy because they help these kids think concretely about ideas and notions that are more abstract. For example, “embarrassed” is a difficult emotion to describe, but it can be better understood if it’s acted out. This kind of symbolic play is important because, as numerous study authors have found, emotion is pivotal to early language and cognitive development because emotions are directly linked to various types of mental functioning. If a child is emotionally engaged and motivated, there is a greater chance they will generalize the skills their occupational therapist is working on with them. Puppets spark creativity, which is especially important if kids are receiving regular, structured applied behavioral analysis (ABA) therapy (which we recently began offering at FOCUS). Our pediatric physical therapists also see the benefits of using a puppet in therapy because children are encouraged to use fine motor skills to control it. How to respond to complex or seemingly confusing social interactions (i.e., a classmate is being unkind to you). Parents can incorporate puppet play at home too/ Many are surprised to find their child is more willing to engage when they aren’t forced to interact directly, but the lessons still carry over to real life. Sometimes assigning certain roles to certain puppets (i.e., “good guy,” “bad guy,” etc.) can be helpful in terms of consistency in conflict resolution. Finger puppets or stick puppets can work well (and helping your child make one can be a fun craft! ), though larger hand puppets are especially effective attention-grabbers. FOCUS offers pediatric occupational therapy in Fort Myers and throughout Southwest Florida. Call (239) 313.5049 or Contact Us online.